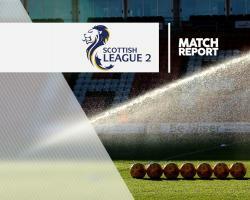 Bottom-club Cowdenbeath boosted their hopes of avoiding relegation from Ladbrokes League Two with a 2-0 win against Clyde. Clyde striker Peter MacDonald had his 11th-minute penalty saved by Jamie Sneddon before Kyle Miller gave the visitors the lead two minutes before the break. And six minutes into the second half David Syme headed in his first goal for the club. Cowdenbeath's second win in four games moved them to within four points of their ninth-placed opponents, who slipped below Edinburgh City on goal difference.